A Victorian tea party expresses elegance and grace. When hosting a tea party, whether a little girls birthday party to a bridal shower or even a wedding a Victorian tea party can fit into every budget. In the 1800’s one of Queen Victoria’s ladies in waiting started having tea and petite sandwiches served to in late afternoon. Dinner in those days was served very late in the evening. Soon, Anna, Duchess of Bedford began having friends over to share her afternoon meal. To prepare for a Victorian tea, consider making homemade invitations use lace or paper doilies to add a decorative touch. Of course, the invitations should be written in a calligraphy font. If you are an individual that has the ability to hand address or hand write each invitation in calligraphy this would add an authentic touch. Nothing makes a Victorian tea party more fun than dressing in the theme of the era. The Victorian fashion era included beautiful bonnets and gloves. Dresses were layered and corsets were worn to enhance the female figure. Women wore their hair in an up sweep and high collars. They decorated their lace collars and necklines with cameo pins. Folded fans were a very popular and important fashion accessory. In fact, the afternoon teas of the era eventually turned in to tea dances where women met potential future husbands. In fact, the folded fan and different gestures by the female that held the fan communicated messages to the potential suitor. Victorian females were usually naturalists and loved to garden. When hosting a tea party, consider flowers, lots of flowers! A garden party is a great venue for a Victorian tea party. If flowers are not an option, it is not necessary to have a centerpiece. In Victorian days, a lace tablecloth was used and the food was the main attraction. 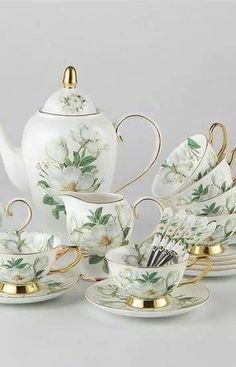 Tea party food should be placed in the middle of the serving table and the tea service should be placed on one end. A coffee service, optional, would be placed at the other end. The best part of a Victorian tea party is you can plan a party on your budget. Tea cups do not have to match. In fact mismatched tea cups make the table look quite charming. If you cannot afford or do not have a lace tablecloth, use paper doilies to get the affect you are trying to accomplish. Linen or lace napkins are a nice touch, but when they are not in your budget, purchase the nicer quality paper napkins and roll them up and tie them with a pretty ribbon and some baby breath and a small flower. It is also acceptable to use a mix and match of linen napkins and place mats. This adds a whimsical effect to your Victorian theme. Have teapots and a variety of different teas available for your guests. Make sure you have herbal tea choices for those individuals that are concerned about their caffeine intake. Make sure to have sugar cubes and tongs, lemon wedges and milk to put into the tea. 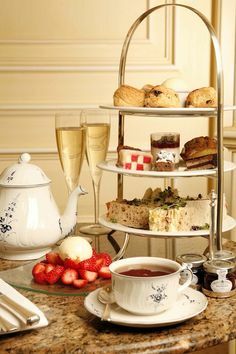 Traditional tea party food would include tea sandwiches, scones, clotted cream, and lemon curd, and a variety of petite pastries: tea breads, muffins and small cookies. It is also important to set the mood for the party with the right music. Victorian music near the end of the era became surprisingly versatile. In the early years piano music was very popular. In the later years, faster music from other parts of Europe became an influence so the polka, jig and waltz were popular. When considering hosting a tea party, consider a Victorian tea party theme. It is a fun way to bring elegance and grace of past traditions into the present day. Give the gift of a special afternoon to your family and friends. You may enjoy it so much you will make it an ongoing family tradition.